Odessa, Ukraine – Nektony is proud to announce the release of Startup Disk Full Fixer – a freeware app addressed to those Mac users who suffer from low disk space and regularly get annoying popups that “Startup Disk is almost full.” Generally, the first thing most Mac users do is to find and delete the biggest files. In fact, there are dozens of junk files on Mac that you can remove without regret. 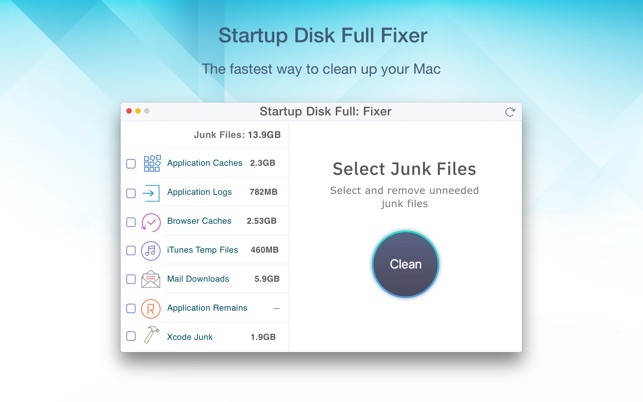 Startup Disk Full Fixer allows you to find and remove useless junk files on your Mac: application caches, application logs, web browser caches, iTunes temporary files, Mail downloads, application remains, Xcode junk files. All you need to free up your disk from junk files is to launch the app, click to Analyze Disk Usage, select the unneeded files, and click to Clean them. Thus, it will take less than a minute to find and get rid of unnecessary service files. The Startup Disk Full app is a small but efficient tool, which helps to free up Startup Disk quickly and safely. Startup Disk Full Fixer is Free to download and available worldwide through the Mac App Store in theProductivity category. For more information, please contact Alex Cormack. Nektony is a software development company with a commitment to release functional, stable and efficient applications for iOS and macOS. Our main focus is to help users to optimize Mac performance and keep the HD clean from junk files. Particular attention is paid to app usability and quality. As a result, our highly skilled team creates the most helpful Mac tools for computer geeks. Copyright (C) 2018 Nektony. All Rights Reserved. Apple, the Apple logo, Macintosh, Mac, iOS and iPad are registered trademarks of Apple Inc. in the U.S. and/or other countries. All other trademarks and registered trademarks mentioned in this press release are the properties of their respective owners.